Trading in the GarageBand strings and brass on these compositions (written while she was the receptionist for the City Of Birmingham Symphony Orchestra) for the real deal, Laura Mvula's debut album arrives garlanded with praise. What's refreshing is that, by its close, not only do you find yourself backing these tips for greatness, but the album — an immaculately drawn piece of jazz-inflected pop — is loaded with such originality that Mvula's carved out a niche of her own in 2013's musical landscape. The entry point for many will be second single 'Green Garden', currently getting heavy radio play, but which almost wrongfoots you as to the album's direction. 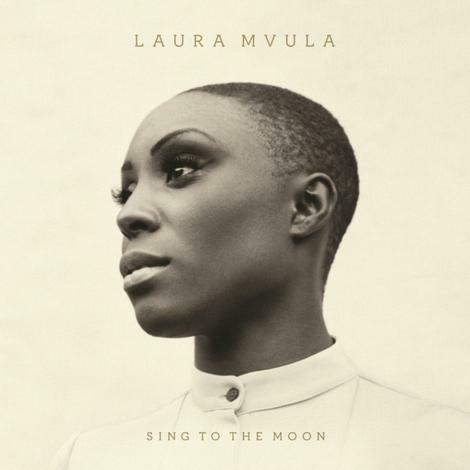 Here, Mvula's voice is the central focus, mellifluent and multi-tracked, placed among a sparse backing track that's arranged with such deftness that it amounts to far more than the sum of its parts. It's a great cut - a sensory dwelling on simple natural pleasure, ran through with a ringing glockenspiel line and powered by a joyous hand-clap and kick-drum - though over repeated listens it emerges that it's Sing To The Moon's longer, more free-form songs that are its finest achievements. The song that follows, 'Can't Live With The World', is a case in point. From the off, the orchestral instrumentation forges something beautiful and perfectly-measured, sonically rich, but never schmaltzy. Crucially, though, space has been factored in in a big way, in both musical pauses and studio silence. In this sense, as well as the jazz-fringed swells of 50s and 60s easy listening recordings, the album recalls Joni Mitchell's Travelogue. Curiously, though, like that record's orchestral interpretations of earlier material, Sing To The Moon has the feel of a retrospective second-go - taking songs and dissembling them before reconstructing in more unusual, and perhaps better, forms. On that track brass and a harp lavishly gild its waltzing rhythm, and a third verse is ushered in with cinematic strings straight out of a 40s epic romance. It could feel too long at six minutes, but it works because it refuses to rise up to the big, anticipated final flourish. Its climactic moments come in waves, as Mvula's multiple voices climb on top of each other, rapidly spiralling upwards to form brief, iridescent moments that drop away as soon as they come. Yet these are the songs' first iterations, which both bears testament to Mvula's skills as a songwriter, one who holds a degree in composition from Birmingham Conservatoire no less, and belies their laptop-based genesis. Later on, first single 'She' continues this trend: building from another spindly glockenspiel motif, the track segues into a choral wash of male/female harmonised vocals as brushed drums emerge, eventually laying down a rigid, stomping military beat. There aren't verses and choruses here, so much as simply surges of intensity, which, combined with the unresolved lyrical thread of a beleaguered, hopeless figure, posits a lingering spectre of tonal ambiguity in the song. A side-effect of these immaculate arrangements is that when Mvula strips them away, for album centrepiece 'Father, Father' for example, the effect is startling. The first half regroups her army of voices, building on Bugge Wesseltoft-esque piano, but they fall away, leaving just Mvula, solo and accompanied by bare, emotive chords. She addresses her estranged father, running over the same unanswerable question "father please don't let me go/ Father father, why you let me go?" (having previously urged him to "let me love you") providing the most intensely poignant moment of the album's central lyrical theme - seeking permission to love, or be loved. It's not without fault: the expansiveness does mean the album occasionally gains a glutinous heaviness, and you might well return to individual tracks more frequently than giving it the full play-through. The full-band track 'Flying Without You' is also a bit of a misfire, feeling a bit superfluous with an irritatingly choogly trombone solo. But this is tempered by Mvula's otherwise finely-tuned ear, most crystalline in the Aaron Copland-like stateliness of strings and brass that grace 'Make Me Lovely's opening and the aerial vocal swathes at the end of 'Green Garden'. On 'Diamonds', Mvula gifts the album with a gem of a closer, her voice intoning a note of lyrical optimism and harmonising with strings to produce moments of heart-swell loveliness, which, over before you know it, leave you gasping. Not only is Sing For The Moon an impressive debut body of work, but it achieves a contrary-feeling sense of greatness: dealing in sonics and a sweetness lifted straight out of the mid-20th century, but wrung through with her individual, original mindset, Mvula has sidestepped any threat of being cast as retro or anachronistic, and produced something that sounds distinctive and fresh-sounding.